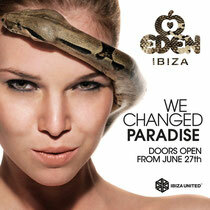 One of Ibiza’s biggest clubs, Eden, has just undergone a complete renovation and refurbishment. Now under new ownership, Dutch entrepreneur Michael van de Kuit, decided to redesign the space to give clubbers a venue where the focus is purely ‘All About The Music’. The news about the club being taken over by a new owner has not gone unnoticed within the international club scene. Open since 1999 in central San Antonio, Eden is a large-capacity nightclub and with the recent reconstruction of the building, the club aims to be reborn as one of the island’s premier destinations. Eden was previously home to events from Pete Tong, Gatecrasher, Godskitchen and beyond, hosting performances from Faithless and Lady Gaga amongst others. Look out for the club’s grand re-opening on June 27. It’s full line-up will be revealed shortly.